OPL company was founded in 1919 by the Duke Armand de Gramont. It took the continuation of a workshop of optics which had worked for the French Army during the war. Militaries will be besides the customers of OPL until the second world war. In 1938, the Duke wanting to diversify the productions of OPL towards the civilian world, makes to build a factory at Chateaudun. The war and the Occupation stop, temporarily, with its ideas of new markets. Towards the end of the war, “personalities of optics” were consulted to offer concepts of civil products being able to be manufactured in Chateaudun, once returned the peace. It was decided to concentrate the efforts on one 35 mm up-range, with screwmount for lens, horizontal roller-blind shutter of fabric, rangefinder and removable back. Shortly, a synthesis of Leica and Contax. The first prototypes were built clandestinely in 1942 and the series was launched in 1945. It was about the Foca “two stars”. Factory OPL were come out until 1961, some of the most beautiful jewels of French photographic industry. In 1964, OPL merges with SOM-Berthiot to form the SOPELEM, which works in the military domain. There is enormously things to relate on OPL and his Foca, then for more, I recommend the many articles of Patrice-Hervé Pont or the superb “Foca Graphie” of Jean Loup Princelle. 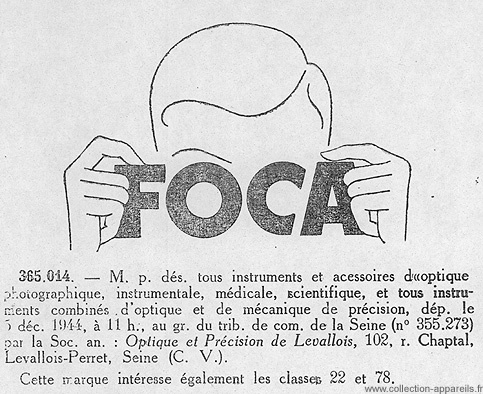 Recent researches led me to discove that OPL had also settled the brand FOTA, on November 6th, 1944 at the clerk's office of the commercial court of the Seine, before settling on December 5th, 1944, the brand and the logo FOCA. 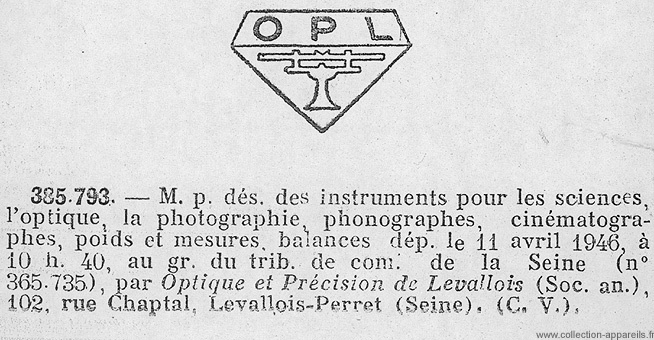 Logo OPL representing a rangefinder in a diamond was settled on April 11th, 1946.